My "u" has decided to play it's own game here. Perhaps it is marching to its own beat, but it will not appear in my typing unless I stop and specifically push it down....hard! Do you have any idea how often you type a "u"????? I think it is time for a new laptop, but we all know what that means. It's hours of transferring things to a new computer. UGH!!! 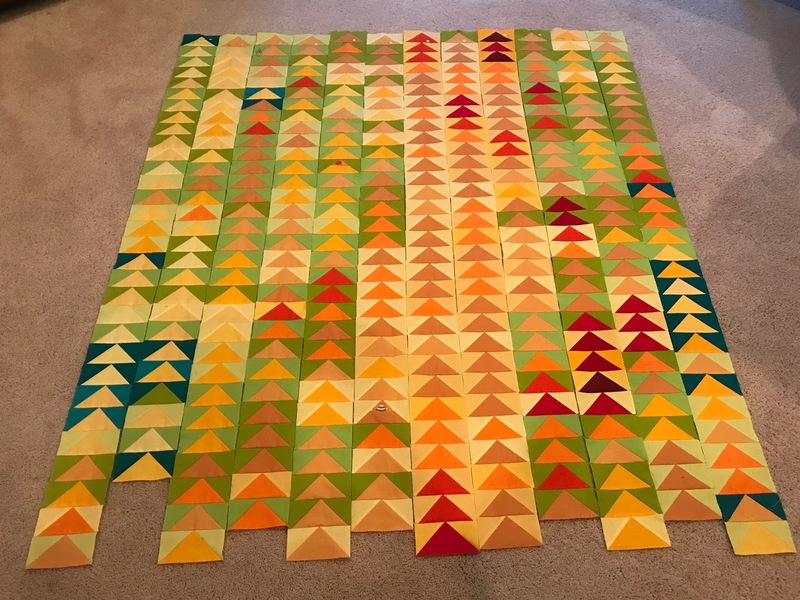 The first row of my Temperature quilt is now finished and the second row is well on it's way to completion. As you can see, it has been an exceptionally warm January for us. It is hard to imagine so many of the 80* color range in January. My design floor has become a bit more challenging with a puppy following me everywhere. 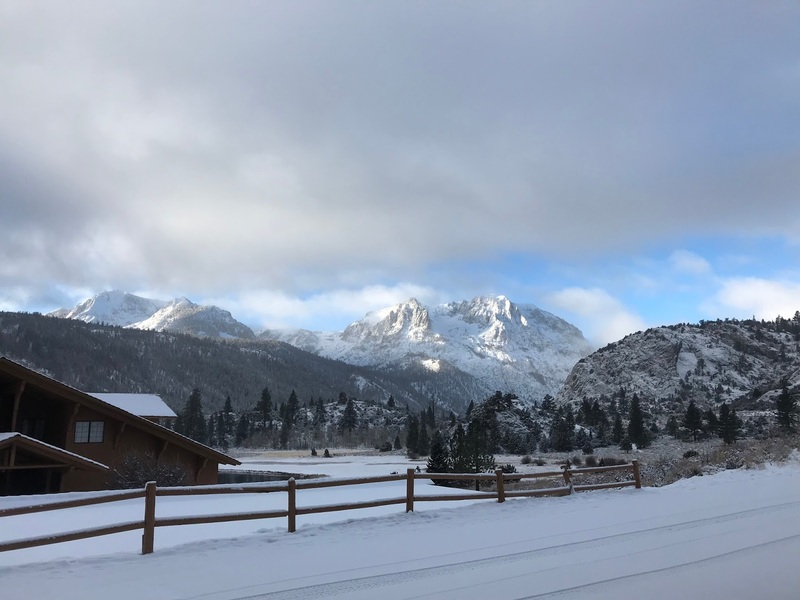 We had our annual family snow trip last weekend. 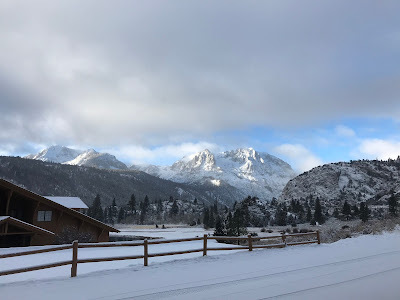 We enjoyed two beautiful snows while we were there, but it was COLD this year. I never tire of the view. I know our snowmen leave a bit to be desired, but they were fun to make and the little ones had fun with them. With so many people there, we eat in shifts. I had to chuckle at the "first shift" photo. Cucumbers on the eyes???? I always love seeing fancy towel folding when I am a guest. I should do this at home for my guests. One final picture from the snow. 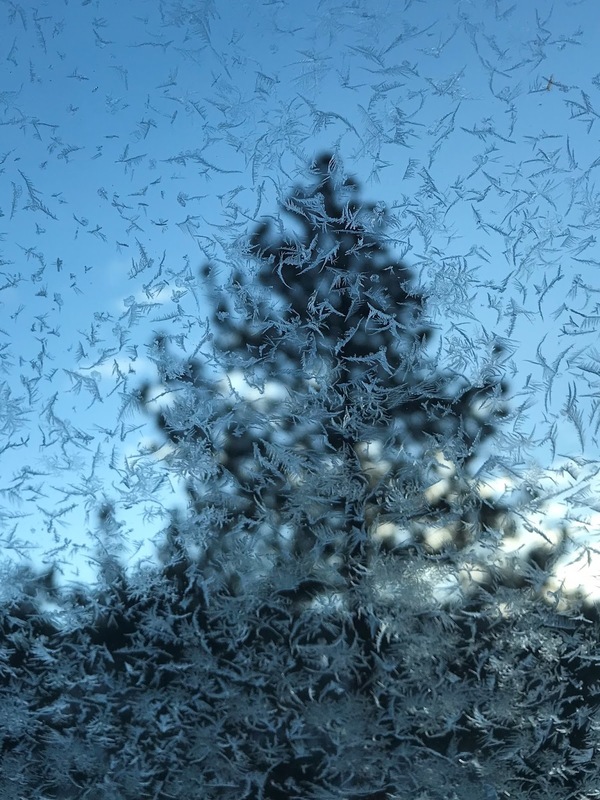 The ice crystals on the windshield were so pretty. I apologize to all of you who live in the cold part of the country for my excitement over visiting it. I know it has been a really cold winter for many of you. 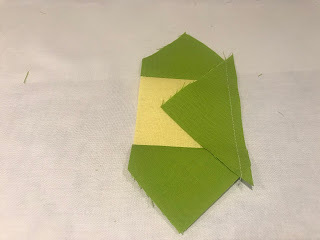 It sounds like a very boring time around here, but I have been busy with some blog hop sewing, assisting a kindergarten class with quilt blocks and helping a granddaughter make a school mythology costume. Perhaps I will have more to show next time. There is always endless stitching in my mind so I am not one who makes resolutions about what I am going to accomplish each year. Perhaps that comes with age. I just enjoy working on what I choose and go from there. Are there a ton of UFOs that are calling??? Absolutely, and perhaps I will accomplish a few this year. This week I have continued to work on On Ringo Lake. I have about 70% of my blocks sewn together now. Once I finish them I will start sewing them into rows with their sashing. I have so enjoyed the process. Here is the most recent photo when I was working on them the other day. 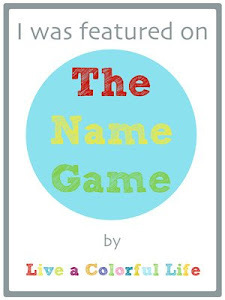 It has been fun to see the other links this week at Bonnie Hunter's Blog. 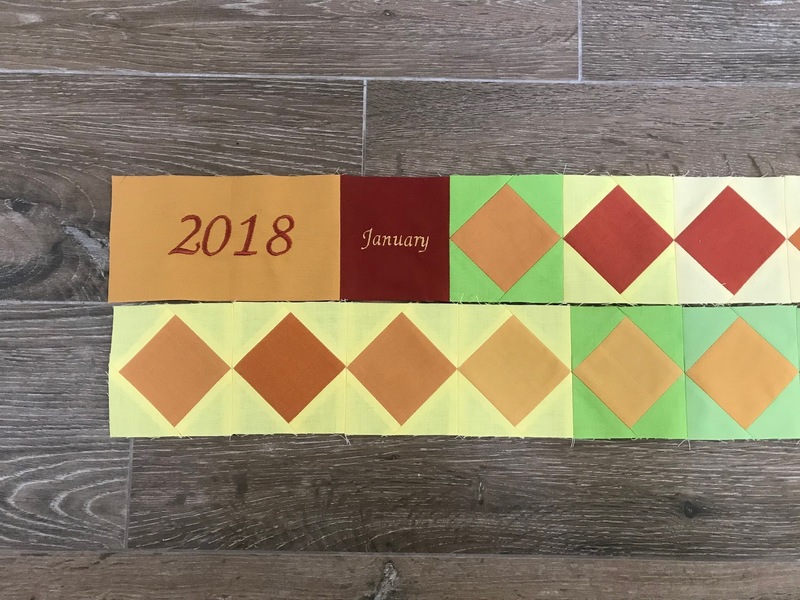 My additional fabrics arrived which allowed me to finally assemble the first blocks of my 2018 Temperature Quilt. As I said, this year I am doing the Square in a Square pattern to reflect my daily temperatures. The square reflects the high temperature and the outer sections reflect the lows. 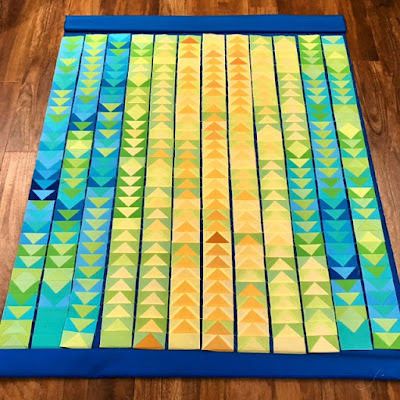 You can find other Temperature quilts on Instagram at #sistemquilt18, #tempquilt18 and #temperaturequilt2018. Again, my sister's temperatures in Alaska make for a very different looking quilt when compared to mine. You can see hers at IG @alaskanquilter. 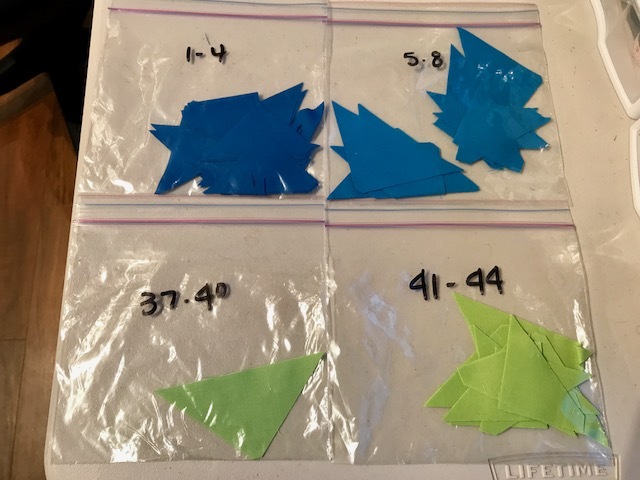 These are the color ranges for my area. January was off to a warm start, but with the storm just passing through I am sure I will soon be adding more green. The storm was badly needed, but our worries of damage in the recent fire area were valid. Sadly, there has been lost lives, homes and property today. The first confirmed death happened to be a friend of ours and the founder of our grandchildren's academy. Both he and his wife were washed away during the night. His wife managed to survived the incident. The images on the television are hard to imagine and difficult to see. Please keep all those involved in your thoughts and prayers. As noted in my previous post, my sister (IG alaskanquilter) and I are going to be doing a Temperature Quilt 2018. 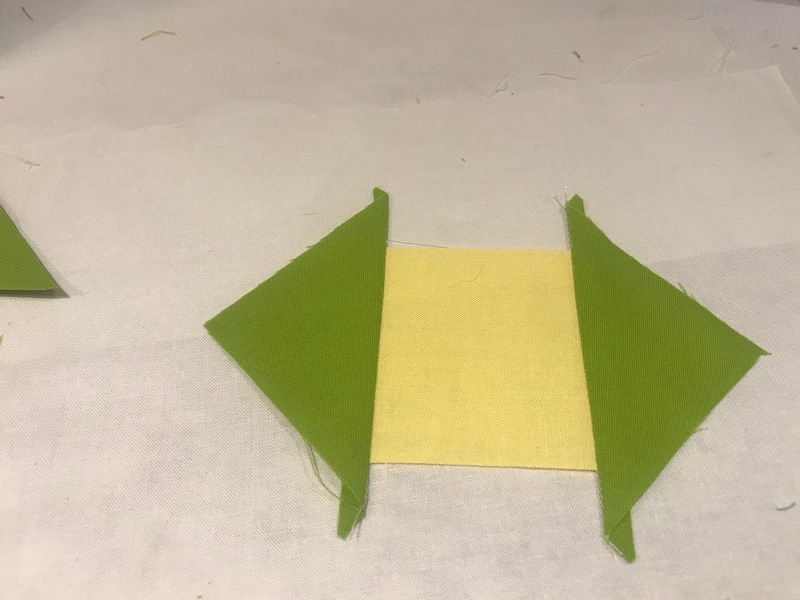 We will link it up on Instagram at #sistempquilt, #tempquilt18 and #temperaturequilt2018. 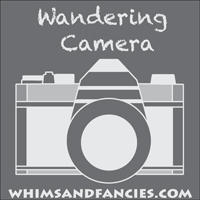 I will also try to figure out how to add a linky to my blog so we can follow everyone's progress each month. The QAL will run for the full year and you can start your year whenever you would like. 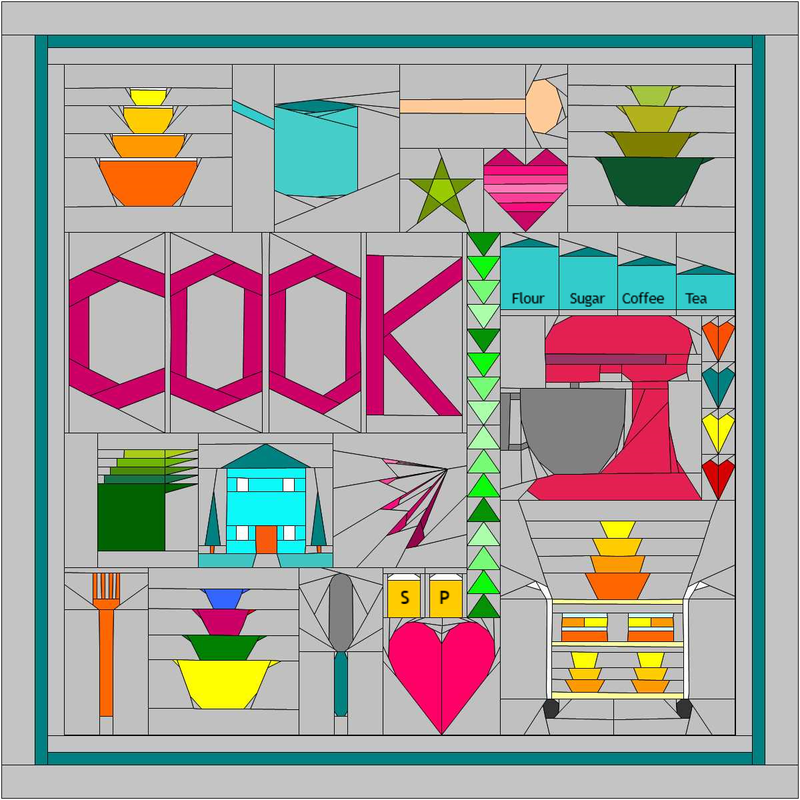 Ideally, you will make one block each day, but life does not always agree with that idea. 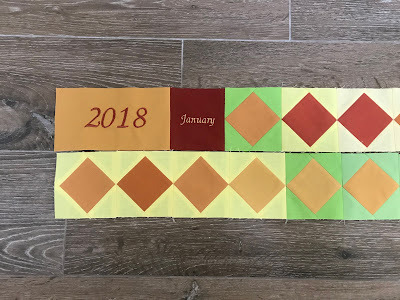 At times this year, I was doing a week of blocks at once. Just be sure to keep track of your temperatures each day. Should you happen to miss a day or so, I found that going to Weather Underground helped me find what the temperature was for any particular date. If you click on the 10 day forecast button it will take you to the page with the "history" section. You can even sign up to have your temperatures sent to you in an e-mail each day. For 2017 my sister and I selected to do the Flying Geese block. I did a 2"x4" goose block with the goose reflecting my high temperature for the day and the sky part reflecting the low temperature. 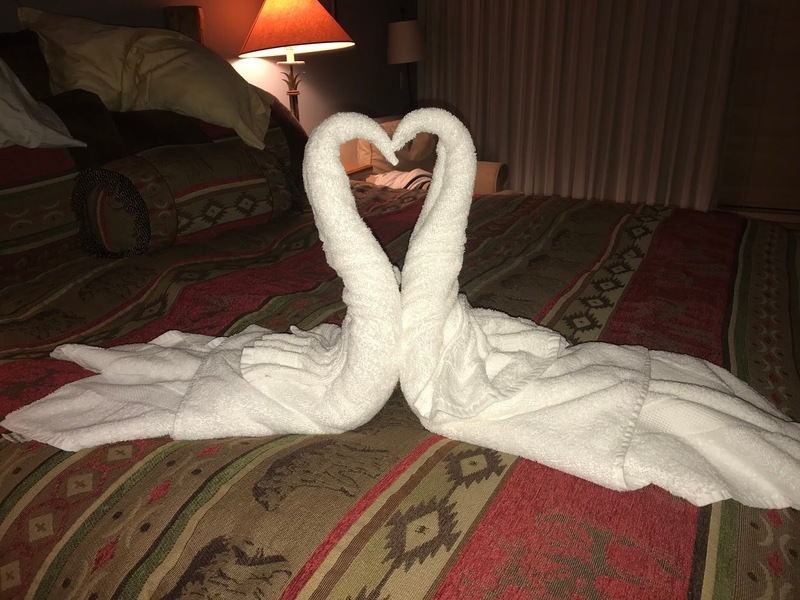 My sister made hers with a 1.5"x3" goose. She also, very cleverly, made her goose fly north or south depending on her temperatures being above or below freezing. Of course, she lives in Alaska and that was not an option for me living in California - thank goodness! 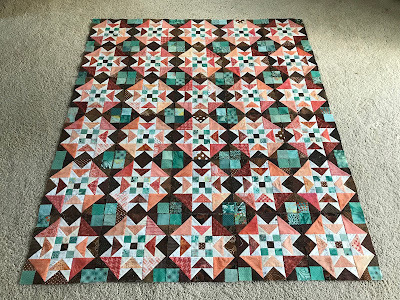 My 2x4 blocks ended up making a quilt approximately 48"x62" before sashing and borders. My sister's makes a good sized wall hanging at approximately 36"x 46.5". 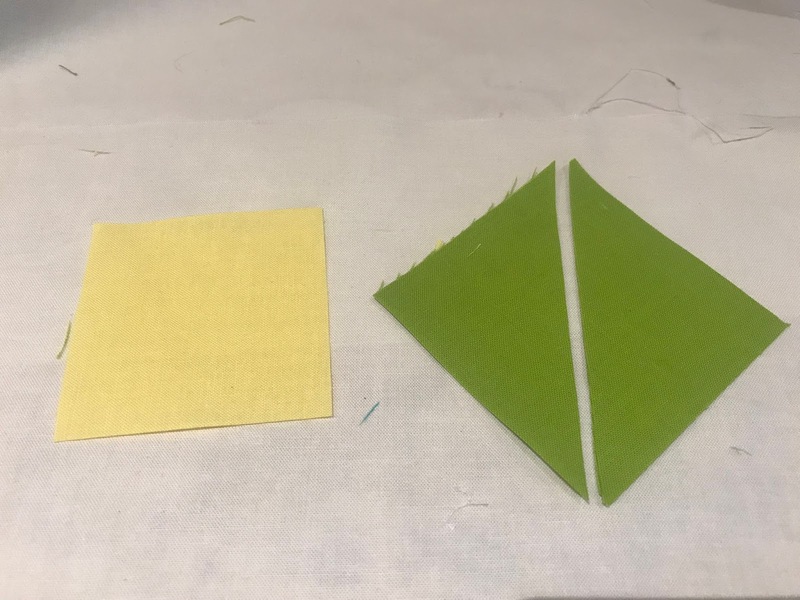 These are our two very different looking finished blocks. In deciding our colors, we broke the color changes every four degrees. Many people have requested that we share the colors that we used to represent our temperatures. We used Kona solids and this is a list of our "blended" temperatures with the reflected colors. Please feel free to use whatever fabrics and colors you would like to represent your temperatures. 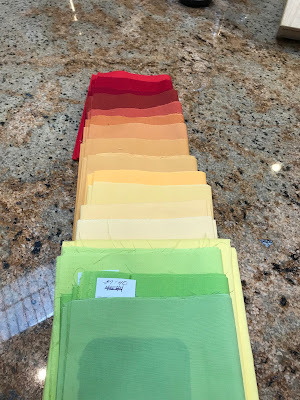 Another question that has been asked is "how much fabric do I need?" That is a great question. 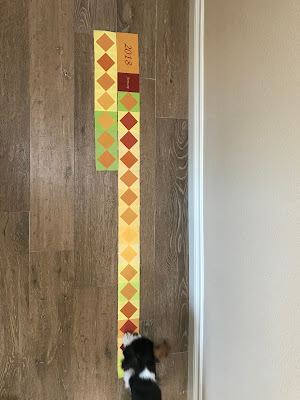 I looked at my own range of temperatures and ordered 1/2 yard of each for my geese. I ended up needing a little more of the mid range temperatures and less of my highs and lows. The nice thing about using the Kona was that I was able to reorder the three fabrics that I needed. I cut my pieces as I needed, but my sister had a great storage idea for hers. This certainly would make things easier to sew when sitting down to put your sections together. This was my method, sad to say. The block we have chosen to do this year is a Square in a Square. 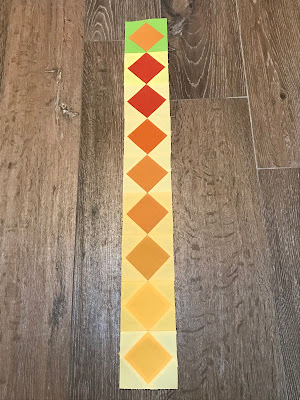 The finished size of the block will measure 3". 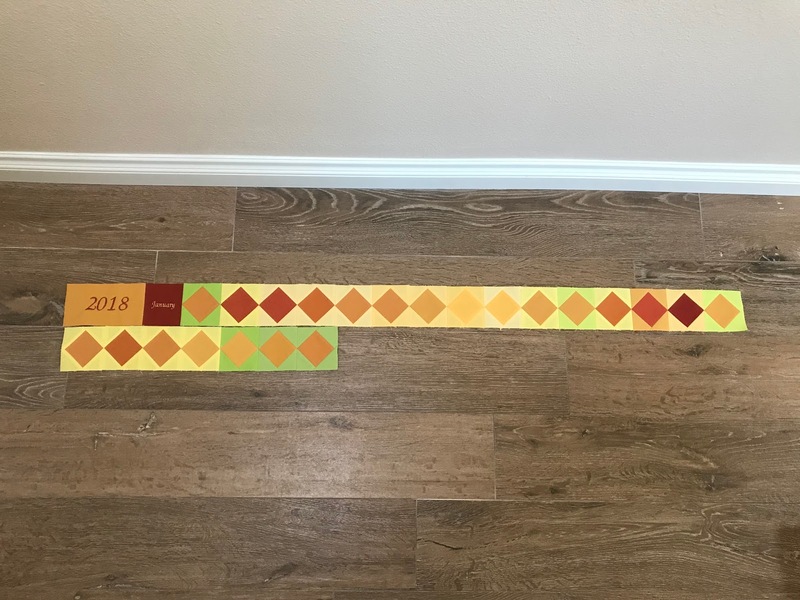 Placing our blocks side to side this year rather than up and down, we should end up with 18 blocks across and 21 rows down - measuring approximately 54" x 63". If you would like to do this block with us, I have written out instructions for it below. 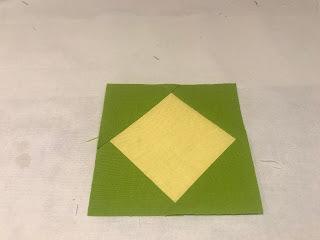 Cut one high temperature square (yellow) at 2 5/8" square. 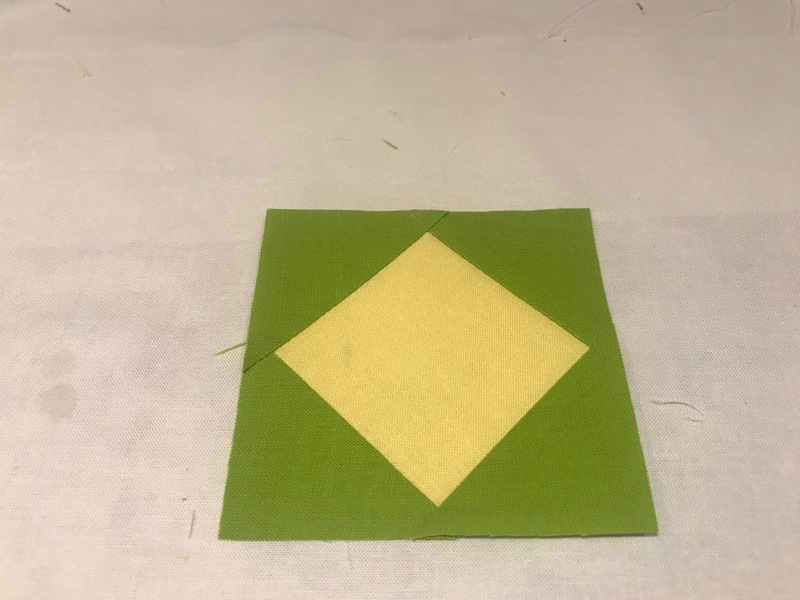 Cut (2) 3" low temperature (green) squares in half diagonally. Using a 1/4 inch seam allowance, sew two green triangles to two opposite sides of the yellow - centering the square on the triangles. Press to the green and trim the dog ears. *Ironing all seems open makes for better nesting as you sew blocks and rows together. 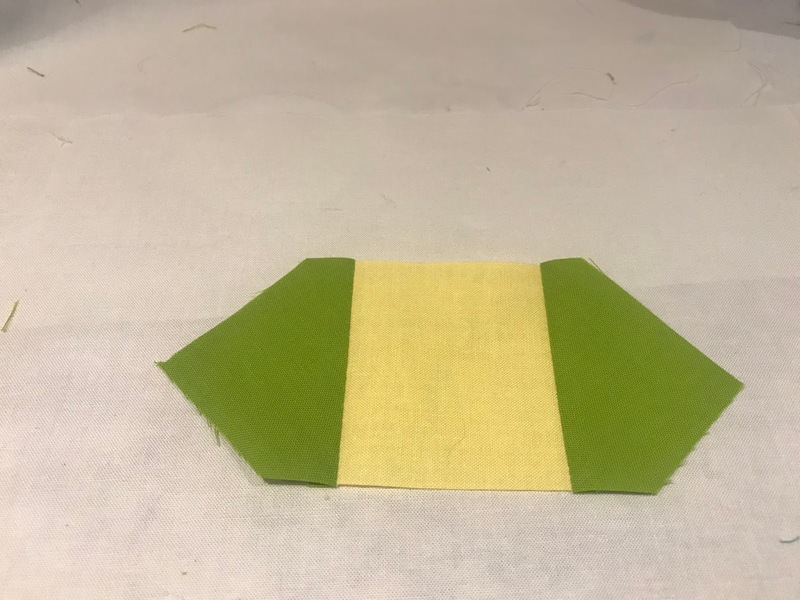 Add the final two green triangles and press to the green. 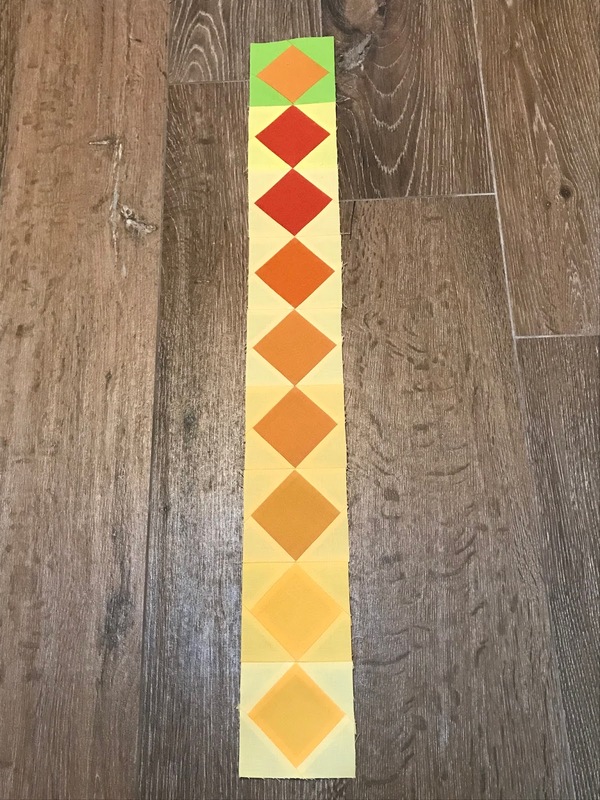 Lay a ruler with the 1.75" mark at the bottom corner and right hand corner of the yellow square. Trim the bottom and right side. Turn block around and repeat for the other two sides. Block should now measure 3.5". We are looking forward to seeing all of the different quilts at the end of the year. 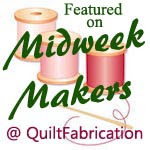 I will be linking this post up with Midweek Makers, Quilts My Way and Freemotion by the River. Happy New Year! I can't believe the holidays are now behind us. Have you started shopping for next year yet? It will be here before we know it. 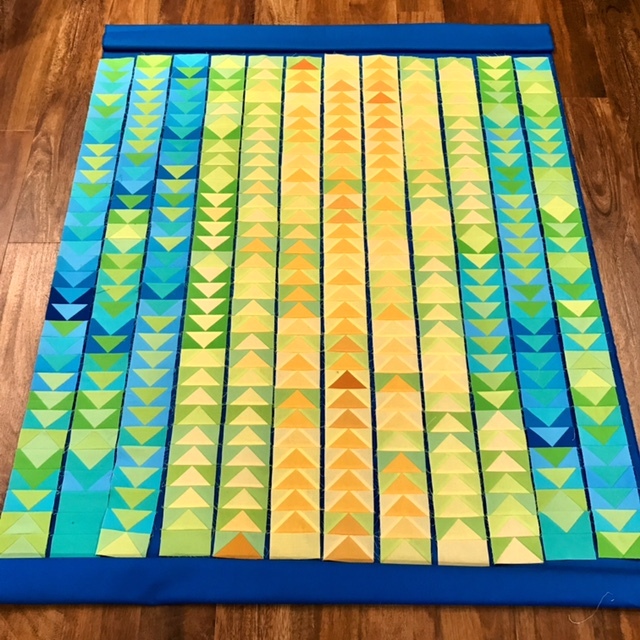 The end of the year also meant the end of recording temperatures and making blocks for my Temperature Quilt 2017. I was saddened to see it come to an end, but really like the finish. 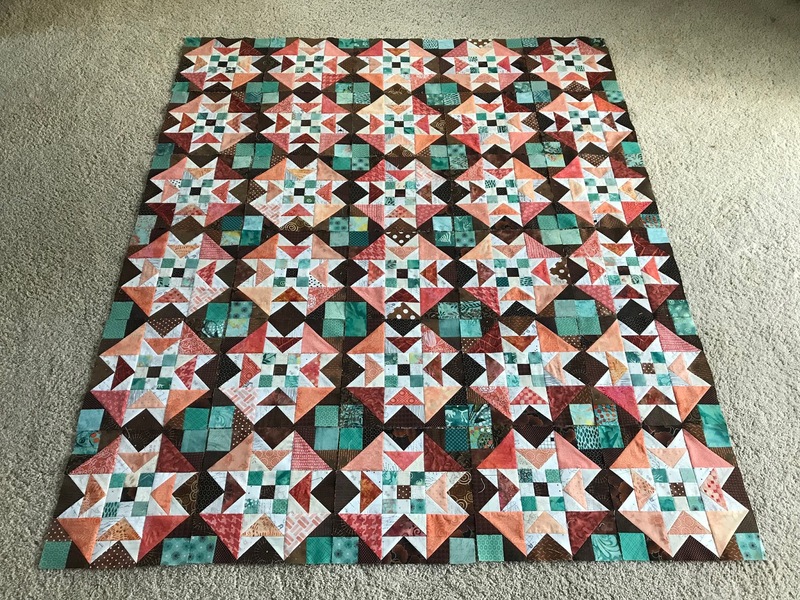 This was a quilt that I did along with my sister (IG alaskanquilter). Needless to say, my temperatures in California are considerably different from hers in Alaska. This was her finish. I loved her colors and I also thought her use of geese flying north or south depending on temperatures above or below freezing was brilliant. 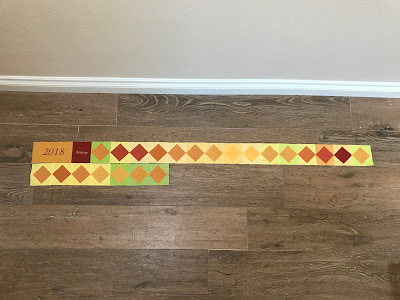 We've had requests to do a QAL for a Temperature Quilt 2018. After discussing it with each other, we have decided to do it. 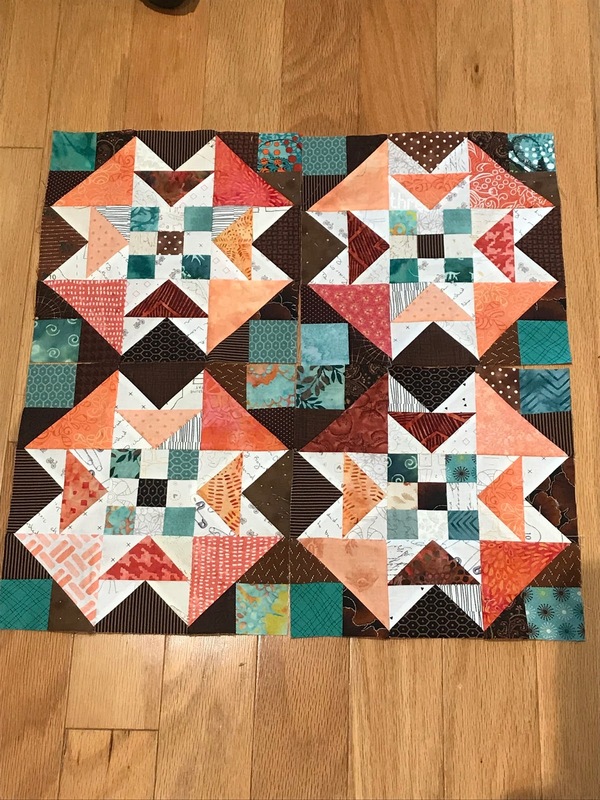 Last year we used the Flying Geese pattern and are thinking of doing either a Square in a Square or a Pinwheel pattern for 2018. We would love to have everyone join us. 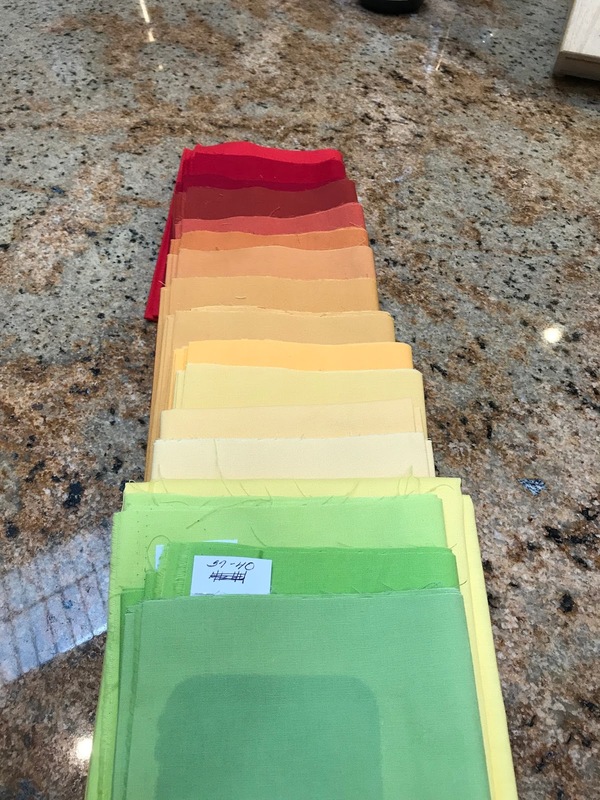 I will post the Kona colors that we used, our temperature breakdowns, details and instructions in a few days. Between Alaska temps and California temps, we should be able to cover most temperatures. 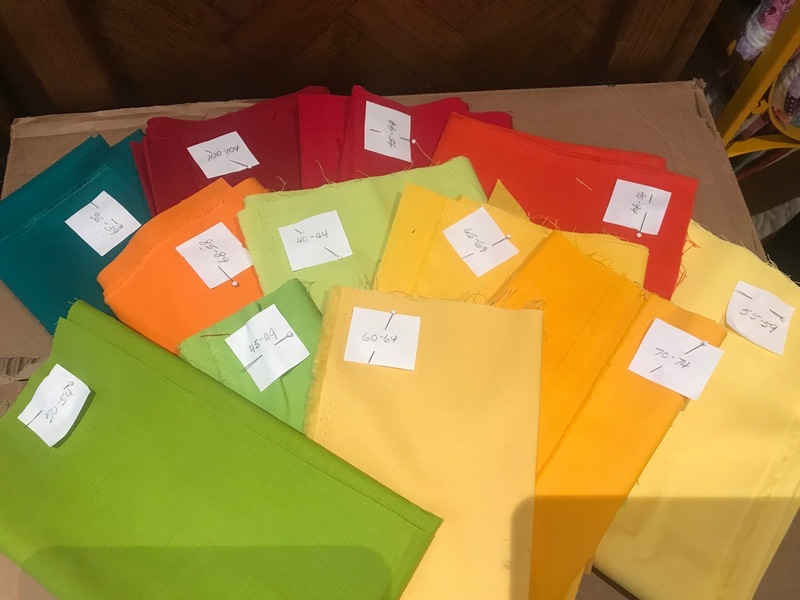 Of course, you can use any colors and fabrics that you would like. Meanwhile, please keep a log of your temperatures until you are ready to sew. In other sewing, the big reveal for On Ringo Lake came out for New Years. The last few clues were fast and furious so I've been plucking away on block construction. I really love the way it is coming together. 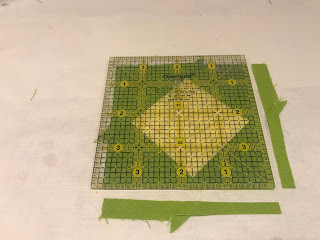 I'll be back in a few days with all of the details for the QAL.